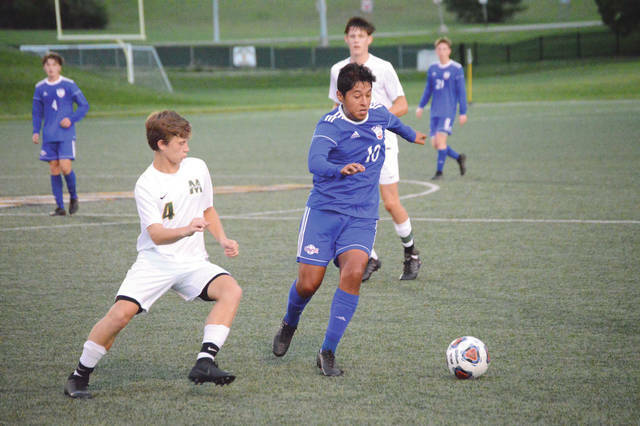 Carroll sophomores Brandon Osterholt (9) and Ben Del Cid (17) shared shoes in Tuesday’s boys high school soccer match against McNicholas at WSU’s Alumni Field. Osterholt had a goal and two assists in the 5-0 win. Carroll senior Adam Cardona (10) goes after a loose ball as McNicholas defender Adam Luckey closes in, during the first half of Tuesday’s boys high school soccer match at Wright State University’s Alumni Field in Fairborn. McNicholas senior goalie Nate Chambers rushes out to deflect away a drive by Carroll’s Armando Campos-Ortiz in the first half of Tuesday’s Sept. 11 boys high school soccer match at Alumni Field on the Wright State University campus in Fairborn. FAIRBORN — Carroll jumped out to a 2-0 lead over McNicholas, went through about a 10-minute run where three Patriots players left the field with injuries, and scored three more goals with just as much precision and ease in a 5-0 win over the Rockets, Sept. 11 at Wright State University’s Alumni Field. Molfenter credited juniors Will Moddeman, Martin O’Grady and Mitch Johnson, along with seniors Sean Dosedel, Travis Schmidt and Justin Schmidt for their solid back line play. One Carroll player had to leave with a severe nosebleed, starter Charlie Thompson appeared to roll his ankle roughly 17 minutes into the first half, and then fellow starter Kellen Williams appeared to go down with a right knee injury about 14 minutes later. 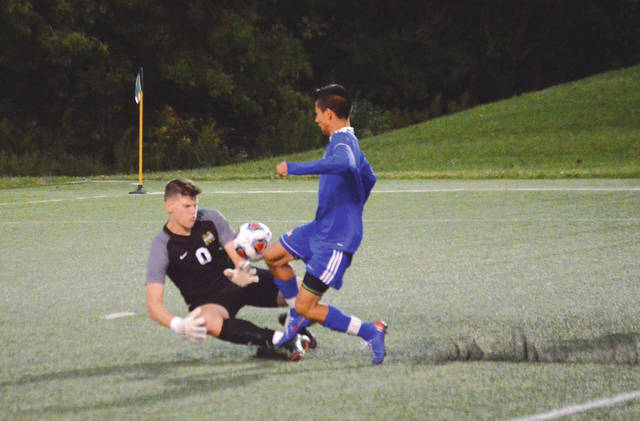 That rash of first-half injuries amped up the need for a solid defensive wall, and Molfenter said those six players stepped up Tuesday night. Williams had scored the first goal of the match, off an assist by Dosedel, three minutes into the contest. 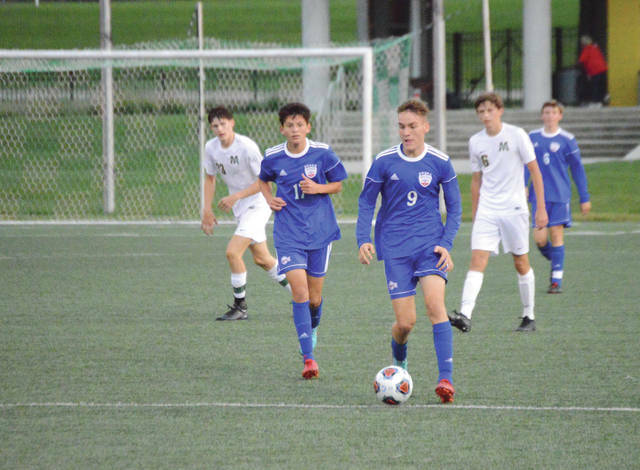 Conner Bailey knocked in a solo score from the right side in the 13th minute, then Erick Vazquez scored off an assist from Conner Osterholt with just over three minutes left in the first half. Osterholt had his second assist with 19 minutes left to play on a Travis Schmidt score from the left side, making it 4-0 in favor of the undefeated Patriots. With just over 12 minutes left to play, Osterholt then earned a score of his own off Ryan Walsh’s pass for the game’s final tally. Carroll is now 7-0 with the win, 2-0 in Greater Catholic League Co-Ed play. Tuesday’s game was moved to Wright State’s pristeen artificial turf field in an effort to give their home natural grass a chance to recover from a recent home football game, and some rainy weather. The Patriots will play their next game at Alumni Field as well, a 7 p.m. nonleague tussle Thursday, Sept. 13 with Wayne. McNick coach David Sandmann chocked Tuesday night’s shutout loss as a learning experience for his Rockets. “We fixed a couple things at halftime, and I like the way they came out and played in the second half, but (Carroll is) a real good team over there. They just wore us down,” Sandmann said. “They’re always supporting each other. Everyone knows what everyone else is doing. They’re very together — there’s no one player out there for them that is trying to do it all on their own — they’re solid throughout. The Rockets (2-5-1, 1-2 GCLC) next play at 7 p.m. Saturday, Sept. 15 when they play at Anderson, in Cincinnati, for a nonleague match.